With the advent of cryptocurrencies in 2009, the stage was set for the world to move towards a cashless reality. Obviously, with so many third-world countries having poor – if any – internet access, this dream is still a far way off, but the framework has been set. Bitcoin was the first of these virtual currencies, but for all the ground that was broken with its innovation, there were, of course, some shortcomings which subsequent cryptocurrencies sought to improve upon. Just two years after Bitcoin was launched, the second digital currency, Litecoin, made its appearance. The primary improvements that Litecoin offers over Bitcoin are a faster block generation rate and (eventually) more coins available on the market. Over the course of 2017, the price of Litecoin has gone from 3.87 at the beginning of the year to as high as $92 at the beginning of September, before slipping back to the mid-50s range. As of this writing, LTC/USD is $56.60. What are the primary differences between Litecoin and Bitcoin? Litecoin, like Bitcoin, is a peer-to-peer (P2P) virtual currency that is not under the control of a central authority. In fact, Litecoin was developed based on the model of Bitcoin, and the two have more in common than there are differences. But the differences are very significant. The first primary difference is the speed in which transactions can be confirmed. A Bitcoin transaction can take up to approximately 10 minutes, whereas that of Litecoin is about one-quarter that. While both Bitcoin and Litecoin have preset limits as to how many virtual coins will be produced, Litecoin’s target of 84 million is four times that of Bitcoin, which means that the supply will be able to meet the demand for a much longer time. How does one trade Dash? Similar to Bitcoin, Litecoins are “mined” by users, who must solve complex mathematical puzzles. In doing so, they earn the right to add blocks to the blockchain, and receive a set amount of Litecoins as a reward. As mentioned above, Litecoin uses algorithms to prove that they have accomplished the work which are more accessible to a greater number of miners. Considering that there will be so many more Litecoins in circulation than of Bitcoins, this accessibility is particularly significant. Like other cryptocurrencies, traders can trade on the rates of Litecoins on forex markets. When a trader opens a valid account with a broker, such as Fortrade.com, they can begin trading Litecoin CFDs. It is not necessary to own actual Litecoins in order to trade CFDs, and with the right Short position, traders can even earn a profit when the price of the currency drops. 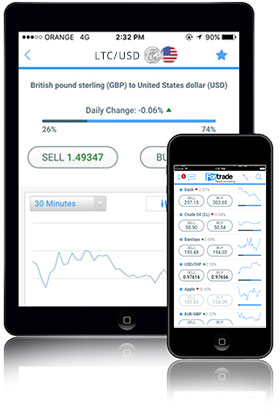 Click on the link below to open a Fortrade account, and start trading today. Please note: Trading CFDs carries a high level of risk. Your capital is at risk. For general information only. Not intended to provide investment or trading advice.